Eighteen down. Thirty-seven to go. As I waited for the curtain to go up on the 5th Avenue Theatre's production of Carousel I read David Armstrong's introductory program notes. David is the 5th Avenue's Executive Producer and Artistic Director, and one of his statements leapt out at me: Seattle is one of America's three great theater capitals. Hyperbole? I might have thought so. 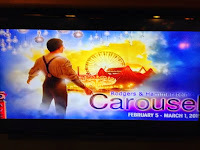 But having seen Carousel, I have to admit that everything about the production strongly supported David's claim. 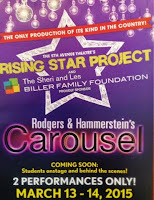 Carousel featured a company of talented and experienced local professionals; it offered excellent dance through a local partnership; and it was integrated into a truly unique and exciting program aimed at developing young talent. The show was produced, designed, built, cast, rehearsed and staged entirely by local talent. Their bios displayed an amazing list of performance credits. 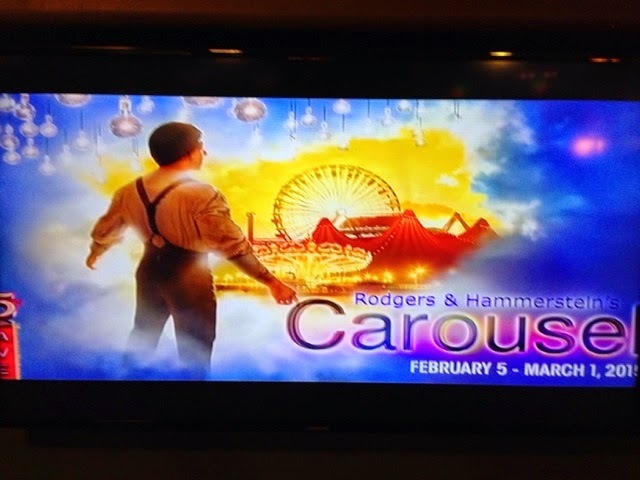 Along with the other artists and theater professionals who staged Carousel, the actors are part of a strong community of players who are able to live, work and develop their talent here because there are so many professional theaters supported by such large theater audiences. Carousel was a partnership between Spectrum Dance Theater and the 5th Avenue Theater, both of which receive ArtsFund support. The 5th has one of the largest theater subscriptions in the U.S. (over 25,000) and an audience of over 300,000 each year. Since 2001, the 5th has premiered 16 new works, nine of which have subsequently opened on Broadway! Two of those, Hairspray and Memphis, won Tony Awards for Best Musical. More evidence for the truth of David's contention. 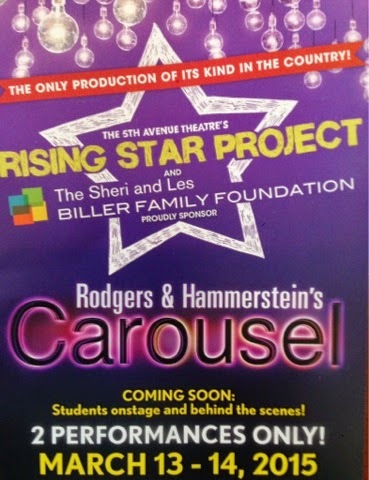 A couple weeks after the show I got to see Carousel performed on the 5th Avenue stage once again, only this time by high school students working in a unique program called the Rising Star Project. With help from the professionals in Carousel, one hundred top theater students from around the state spent months recreating the show using the 5th Avenue's direction, choreography, sets, costumes, lighting and music. The atmosphere was electric and, by chance, I was seated next to the actress who appeared as Carrie in the professional production, Billie Wildrick. She commented at the start how fun it was going to be to "see herself run on stage" and was clearly very proud and pleased with the student performances. It was easily the best student musical I have ever seen, and I found myself wishing the program had existed when I was a local high school thespian a few years (ok, decades) back. After reflecting on the entire Carousel experience, I have to agree with David. We should never use the term "regional" to describe our professional theater. Just say it's a "Seattle show". People will know it's from one of America's three great theater capitals. Seventeen down. Thirty eight to go. I always seem to run into old friends and get pleasant surprises when I visit Tacoma, and this trip to see Tacoma Opera's H.M.S. Pinafore was no exception. This time I learned that several of my old friends are Tacoma Opera regulars, and I had the pleasant experience of discovering why: this is a fine company with lots to offer. The large audience for H.M.S. Pinafore clearly enjoyed this show and, as one of my friends commented, the performers were having a lot of fun and - appropriate for Gilbert and Sullivan - the show didn't take itself too seriously. Founded in 1968 as the Tacoma Opera Society, Tacoma Opera turned professional in 1981 with help from Seattle Opera's director of community outreach Dr. Hans Wolf, who became the Opera's director. Tacoma Opera is proud of being accessible to audiences from every walk of life. In additional to lighter fare such as Gilbert and Sullivan, Tacoma Opera presents many traditional operas and has produced several premiers. Up next in April is French composer Charles Gounod's Romeo et Julliette. http://www.tacomaopera.com/upcoming-events/romeo-juliette/. The company also strives to develop young talent, casting professionals alongside emerging artists. 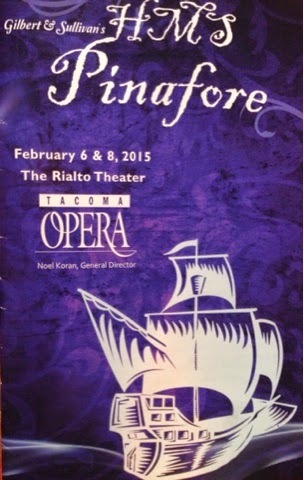 This production of Pinafore, for example, featured local professional baritone Michael Drumheller (his first performance with Tacoma Opera). He lead the cast as a very funny Sir Joseph Porter, First Lord of the Admiralty. A singer with strong training and experience, Drumheller has performed with opera companies all across the country. Playing alongside Drumheller were a number of young performers like Jordan McClellan, who appeared as Cousin Hebe. A past member of Tacoma Opera's Young Artist Program, she is an emerging artist with a beautiful voice and very appealing stage presence who is slated to appear in several shows in the region this year. A former colleague of mine, Kathy McAuley, chairs the Opera's board, and although she was off on a jaunt to South America she made sure I was welcomed at the Rialto Theater. 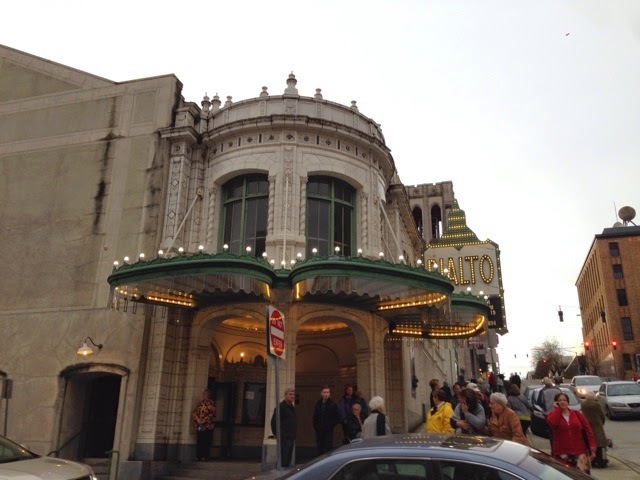 The Rialto is a Beaux-Arts style vaudeville performance and movie house that opened in 1918. Restored in the 1990s, it is today lovingly cared for by the Broadway Center for the Performing Arts, which manages three theaters in Tacoma's theater district: the Pantages, the Rialto, and Theater in the Square. The Center itself receives ArtsFund support and will be featured in a future post. I want to recommend seeing live music and theater in Tacoma. The shows are well worth a drive, there are a number of excellent restaurants close by, and parking is inexpensive and plentiful. Check out upcoming events at http://www.broadwaycenter.org/events/upcoming-events.